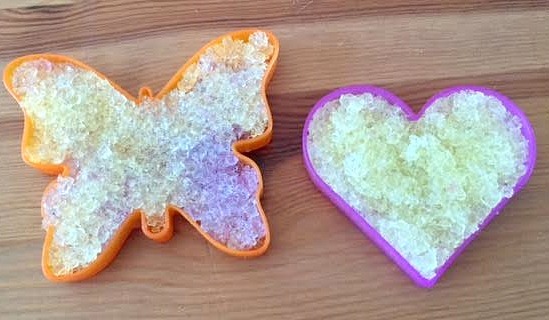 If you haven’t seen already, I recently did a review of a couple of the Orbeez spa products and ever since trying out those fun products I just couldn’t get enough. 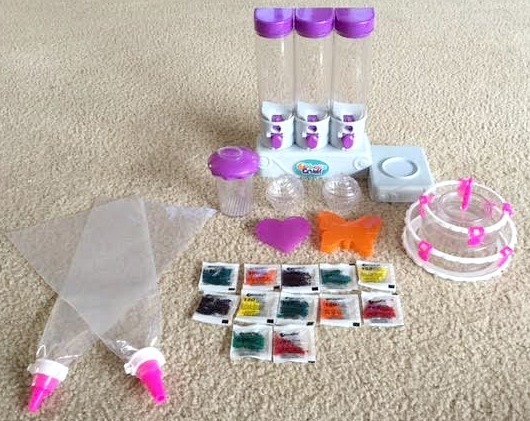 I wanted to try some more of these fun sensory water beads. So with the help of Orbeez I was provided a Sweet Treats Studio in exchange for my honest opinion on how it works. At first I was very hesitant about this product because I had experience before with crushed up water beads and it was not fun having to clean it up off of anything it got on, it was a disaster. Then I tried out the Orbeez Crush and I can happily say that I did not have the same experience as before. 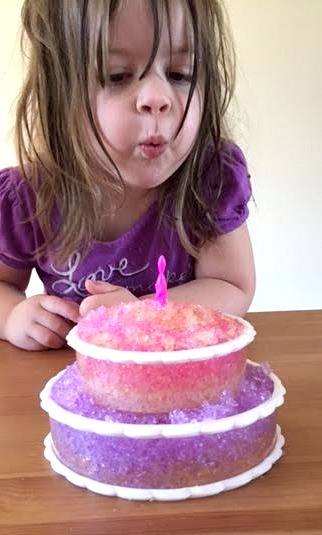 I loved doing this with my daughter and even though it got a little messy, the clean-up was quick and painless. What is included in the Sweet Treats Studio? 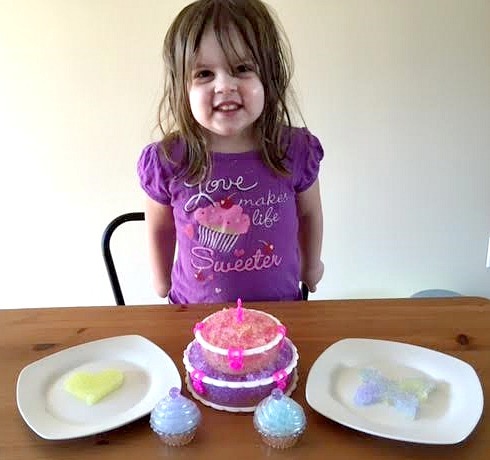 This product is recommended for children ages 5-12 so my daughter, who is 3 and is pictured using the product below, was carefully supervised the whole time she was playing. The very first step that you need to take before using the Sweet Treats Studio is to grow the Orbeez. I did separate colors into separate cups. Although I would assume that if you wanted to take up less space than you could grow multiple colors in one cup since that is how they are grown with the foot spa. After about 4 hours your Orbeez will be fully grown and ready to play with. You can dump them in the crushing station in any pattern that you like. This was one of my favorite parts because I loved seeing all of the colors next to each other. Also it was a lot of fun pushing the button and then watching Orbeez come shooting out like a little candy dispenser. Another great thing about the crushing station is that if you decide to take a couple hour break from playing with the Orbeez it is a perfect place to store them until you decide to play with them again. One word of advice is to not dump water into them because it will leak out. Now it is time to crush. This was so much fun. My daughter loved it and after a few tries she was able to do it all by herself so any child between the ages of 5 to 12 should have no problem, especially after trying a couple of times. 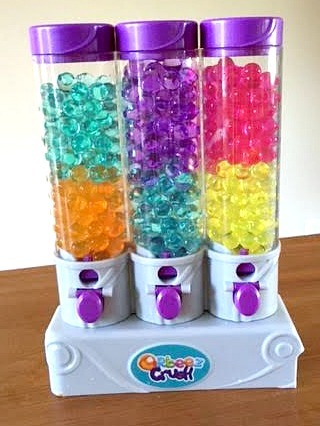 It is also easier if you just add a few Orbeez at a time without filling the whole container up. Now it is time to decorate and there are a few different things that can be decorated. First there are the cupcakes. The cupcakes can be a little hard to fill. There are two tips for the piping bags and at first I didn’t notice that they were different sizes and I accidentally used the bigger tip. 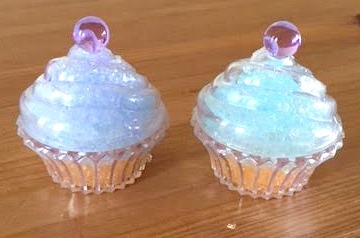 As soon as I noticed that the other tip was smaller I switched them out and I was able to fill the cupcakes even easier. My favorite part of the cupcakes is that you top them with a whole Orbeez. Then there are two cookie cutters. There is a butterfly and a heart. 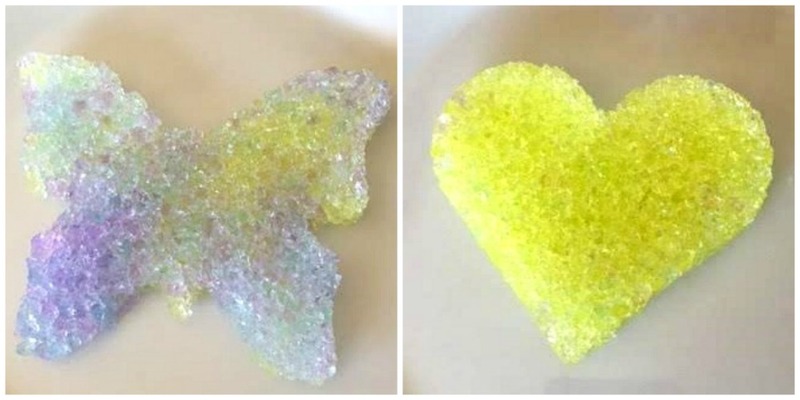 The idea of these is to fill them up with the crushed Orbeez and then flip them over and the Orbeez will stay in the form of the shape. I was pretty doubtful that the shapes would keep their form after leaving the cookie cutters but….. It worked! I was so surprised and excited. They looked so cool with all the colors my daughter decided to use. The last thing that can be decorated in the Sweet Treats Studio is the cake. This is a two tiered cake with a few hanging decorations and a candle to place on top. 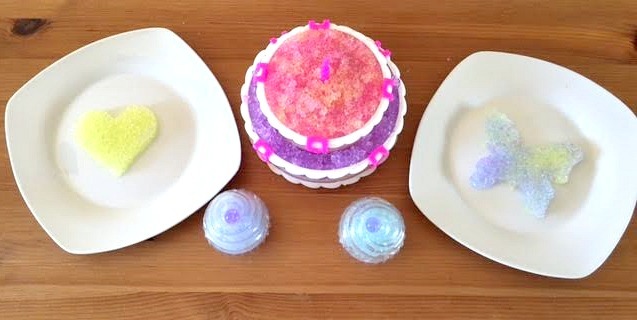 The crushed Orbeez look so cool mixed with different colors so it is really fun to mix colors to fill the cake with. Also it is so easy to fill up the cake but can be a little messy, but as I said before it isn’t too hard to clean up the mess. There are all of our finished products. 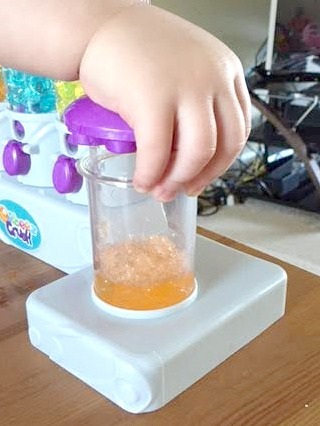 We had so much fun playing and decorating together and then we had some cute crushed Orbeez décor for a couple of days until we finally decided to throw it out so we could store it away until the next time we wanted to play. 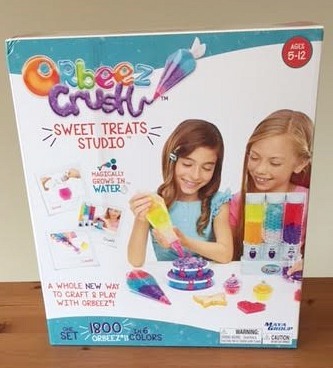 I am looking forward to playing with the Sweet Treats Studio again with my daughter and I want to hear what your child’s favorite part of playing with this product would be? Do they play with Orbeez? If so what is their favorite activity to do with Orbeez? Send us your favorite Orbeez pictures by tagging @ashleyblegen and @Orbeezone on Instagram! Orbeez is giving away one relaxing hand spa with 6 hydrated bottles (which will give you 300 extra Orbeez that you don’t have to wait to grow). To enter to win all you have to do is complete one entry in the form below but the more entries you complete the better your chances will be! Also don’t miss out on another Orbeez giveaway we are hosting for an Ultimate soothing spa (the Orbeez foot spa) that will include 2,000 extra dehydrated Orbeez! *This giveaway is over. The winner is Kelly M! The winner has 24 hours to respond to their email or a new winner will be chosen. Congratulations! To enter just fill out at least one of the entries on Rafflecopter form below! This contest will end June 14, 2016 at 11:59 pm Eastern time and is open to US and Canada only. Special thanks to The Maya Group for providing this giveaway! Good luck! Winner will be chosen randomly by 5/16 and be notified by email. The winner has 24 hours to respond, or a new winner will be chosen, and so on and so forth. The prize will be fulfilled by the sponsor. Looks relaxing. Can’t wait to try it . I enjoy the beads themselves; you can do so much with them. I would love to try the spa! My favorite Orbeez product is the Massaging Body Spa because it looks really cool, something different. I also like that it can use it as tween/teen room furniture .